Description: The B798 power pulls off from their train to pull down to the station main to pick up 2 more engines before pulling their train south. Description: CSX S62029 heads south. Description: CSX S62029 crosses Sandy Creek on their trip south. Description: CSX B75628 holds the siding while S62029 heads south with CN power. Description: On the Superior Subdivision crossing the Valley Subdivision diamond at JO Crossing, Center Ave., 1315 hours. #1203 headed for scrapping at Larry's Truck and Electric of McDonald, Ohio. 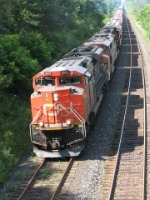 Title: CN 8837 at Mile 5.8 Strathroy Sub. Description: CN 8837 Leads a WB at 16th St. Title: CN 8837 West at Mile 5.8 Strathroy Sub. Description: Two for the price of one. CN 8837 flies around the corner on the approach to the Denfield Rd. bridge, as CP 441 slowly pulls up to the east switch at Lobo on CP's Galt Sub. Description: After bringing in A431 for the yard. Description: Entering rural Macon County at sunset. Description: Pelletier SUB, Milepost 6.27. Description: He's pulling down to a stop to let a northbound take a siding. Fortunately, I'm on the right side of the crossing to get away.